Just a decade ago, in the pre-crisis times, the Russian art was synonymous to «big money», with buyers hunting an Aivazovsky or a Repin and being ready to pay fortunes for them as they knew they would sell them for double price. The times have changed, and another Russian art bid doesn’t make the auctioneer sweat. But the art has not changed, it’s the same and it’s here, at The State Russian Museum, specially constructed to keep paintings of Malevich and Shagal etc. home. Here are the 10 most famous of them. Black Square is the most popular Kazimir Malevich`s painting and maybe the most known and controversial painting in the world. What might be unexpected for you is the fact that there are four versions of this masterpiece. The first of them was done in 1915. As for the last one, art experts suppose that it was painted between the 1920s and 1930s. 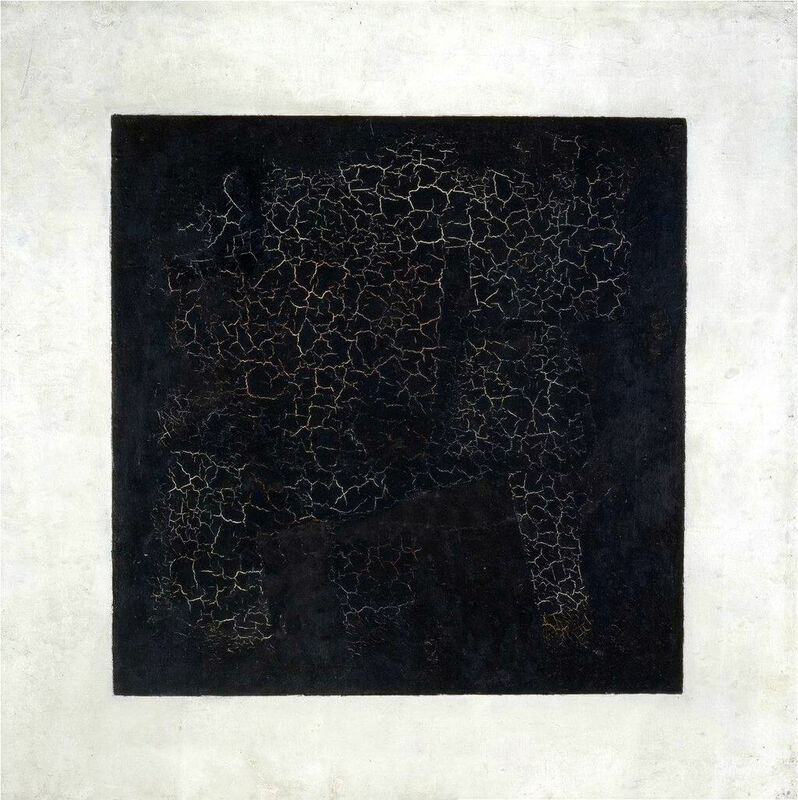 The Black Square undoubtedly is one of the most mysterious paintings of the 20th century. Artists tell that there isn`t only one color as you might think (and as we did). This painting includes almost all known basic colors, except… black. In fact, the painted figure is not a square, because it has no parallel lines. There is a guess that the square wasn`t black at first. Malevich tried to create a painting in the style of cubism, but then decided to paint only the black square on the top of the previous picture. 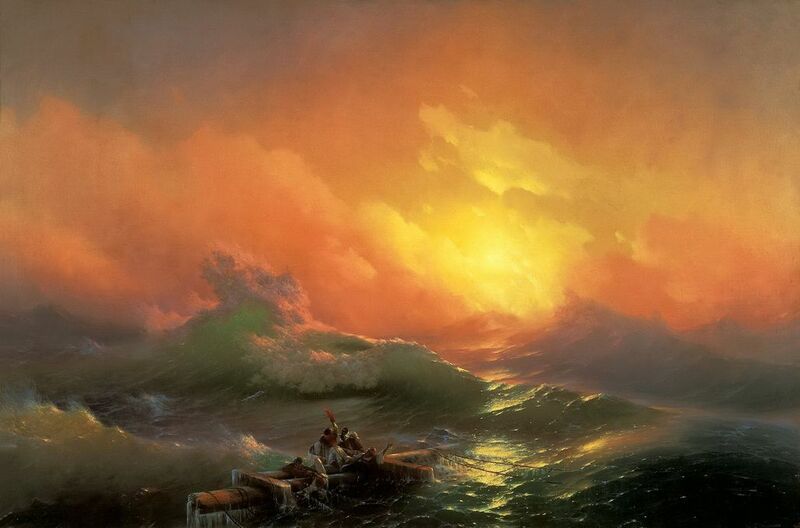 The Ninth Wave is a great painting of the 19th century made by Ivan Aivazovsky. The picture was painted in 1850. In XIX century, seamen thought that the 9th wave was a really bad sign, because it was the biggest and the most destructive. In the picture, six seamen are meeting this wave. Their ship had been broken, so they could die. To tell the truth, all painted waves are not so big, and all the heroes might have survived. Warm tones of the picture also show that they obviously had some chance. Aivazovsky is a Russian genius marine painter, one of the most prominent marine painters in the world. His Ninth Wave shows the beauty of nature and its destructive side at the same time. 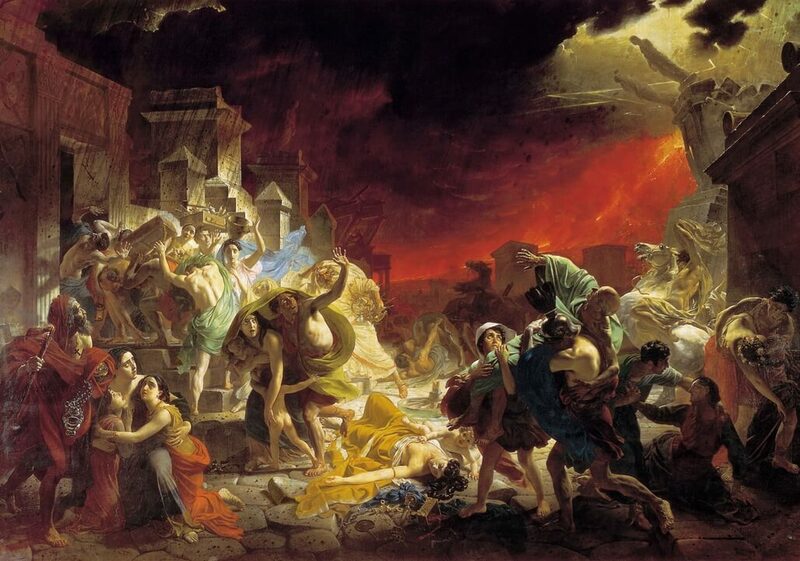 The Last Day of Pompeii was made in 1833 by famous Russian painter Karl Bryullov. At first, the painting was presented in Rome, but then it was taken to Louvre. Only in 1934, The Last Day of Pompeii appeared in St Petersburg, where Alexander Demidov presented it to Nicolas I of Russia. The plot of the picture was created by Bryullov while he was travelling near Mount Vesuvius. Scientists suppose that there was a town called Pompeii and destroyed by Vesuvius. All people in the picture are on the brink of death, some of them tried to pray – they believe it could save them. Lots of art critics think that there are two main characters here – a dead woman and her little child. 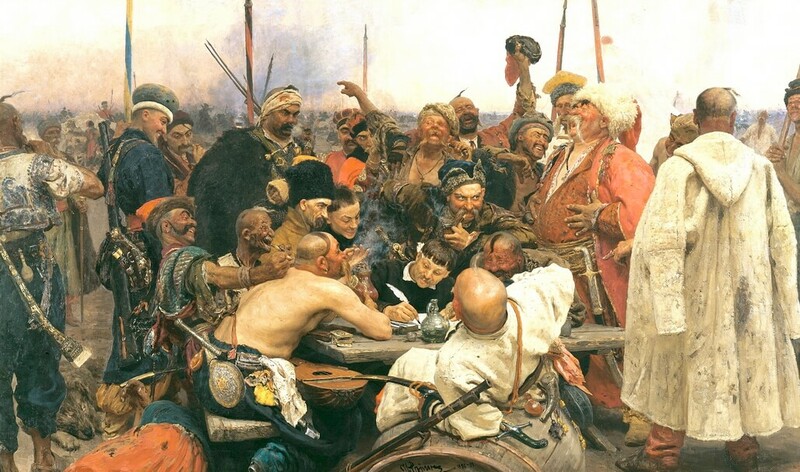 Cossacks of Zaporozhe Are Drafting a Manifesto, also known as Reply of the Zaporozhian Cossacks to Sultan Mehmed IV of the Ottoman Empire, is a painting by Ilya Repin. The picture is painted on a huge canvas so it took almost a decade to finish it, from 1880 till 1891. The painting was bought by Alexander III of Russia and then placed to the State Russian Museum. The first rough drawing of the picture was made in Zaporozhe where Repin was there in 1880 with his friend, young Russian artist Valentin Serov. All painted people had their real prototypes. Some critics say that the painting has no historical accuracy. After the first version the author began to paint the second one (it was going to be more truthful), but he had no time to finish it. Mark Shagal`s Walk (made in 1917) shows us only two simple figures – a man and a woman. 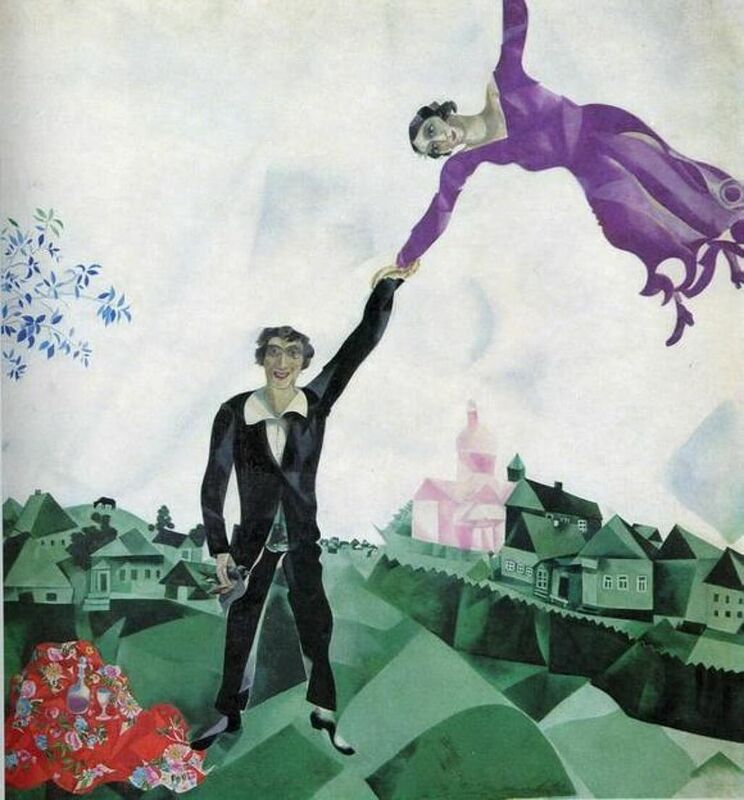 They have their real prototypes – the man is the author of this painting and the woman is his wife Bella. He really loved her and painted only her even after her death (although he tried to find a beloved). The author tried to show that for two loving people nothing is impossible. Shagal shows his wife flying. They hold each other by their hands. It`s a symbol of their love. Some people suppose that the author thought about one Russian proverb – ‘it`s better to have a little bird in your hand then a free big bird in the sky’. Walk shows us that it`s unnecessary to make a choice sometimes: the main character holds a little bird and a ‘flying bird’ in his hands at the same time. The Pancake Week, made by Boris Kustodiev in 1916, is not the only one painting about this festival created by this artist (there are also versions of 1917 and 1921). In this picture, the last days of winter are shown. All people have fun and prepare to burn the symbol of the festival to put an end to winter. The sky has a warm blue color that means spring`s coming. 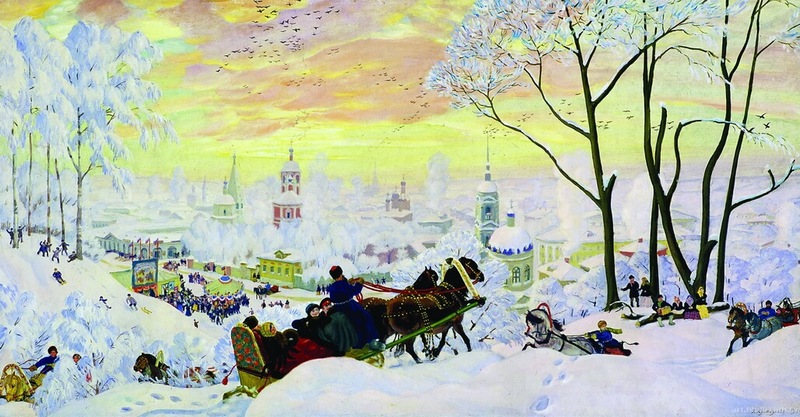 Kustodiev uses only bright beautiful colors to show people`s joy and happiness. All towns painted by this author are faceless. Such festivals were held almost in every Russian town. And sometimes Maslenitsa was veeeeeeery hot — watch a video from a Russian movie in our post on the celebration of Maslenitsa in St. Petersburg in 2017. 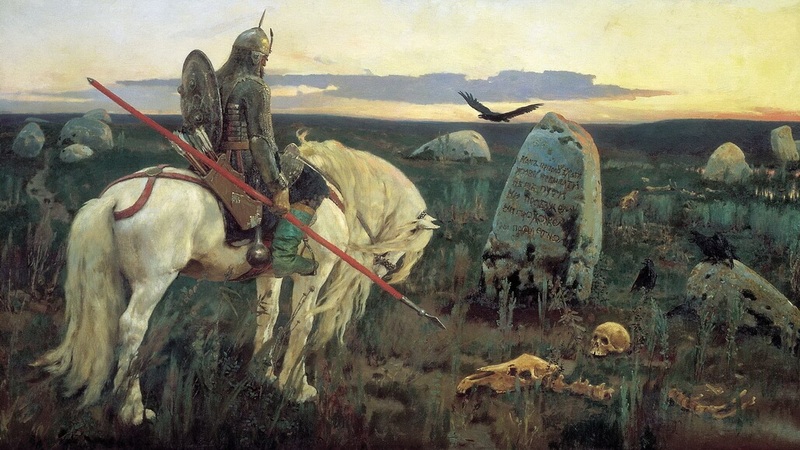 Viktor Vasnetsov painted The Knight at The Crossroads in 1882. Some previous pencil drawings of this picture were made in 1870s. One of the most famous Russian epics Ilya Muromets and robbers had a great influence on the plot of The Knight at The Crossroads. In the picture, the stone writing is real – it is equivalent to the words from the epic. The first rough drawing showed the knight in full-front position. Also there was a road. In the final version Vasnetsov took it away to make the painting more dramatic and made the knight`s figure bigger and more monumental. In the State Russian Museum there is the second version of this picture. 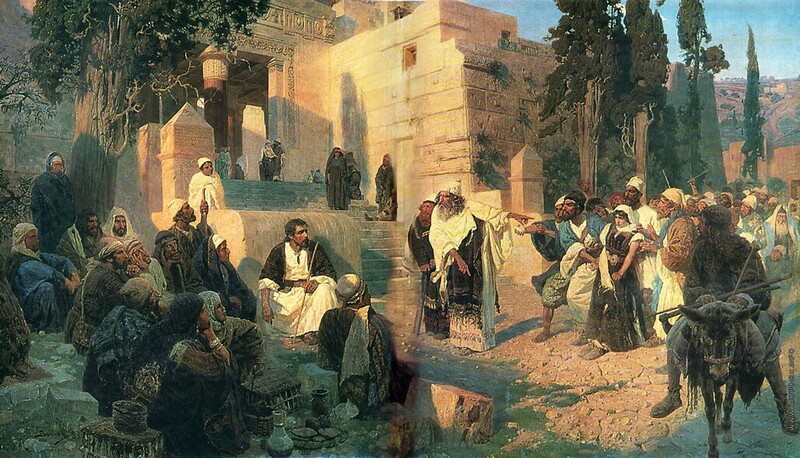 The Christ and the Sinner, also known as Who has no sin (1888), is a painting by Vasiliy Polenov. The plot of this picture is based on story from the Gospel According to John about the Christ and a sinner. 15 years have passed from the appearance of previous pencil drawings to finishing the oil-painting. The painting was bought by Alexander III of Russia and then in 1897 was placed to the State Russian Museum`s collection. The painting features several people. Some of them took to Christ (who was teaching his pupils) a woman who was accused of infidelity and asked what to do (they were going to beat her with stones). According to the Gospel, the Christ suggested it be done by someone who had no sins at all. There were no people without any sins so they let her go. Burlaki, or Barge Haulers on the Volga, in a picture made by Repin in 1873. The author saw barge haulers near the Neva River for the first time. He was amazed by them: they looked so different to other happy people. They were tired and worried. Before the main version of the painting was made, Repin had drown lots of pencil sketches and watercolor schizzos. The final version of the Barge Haulers on the Volga shows us how the work of these people is difficult. They are tired and unhappy. In the background, there is a towboat as a symbol of technical progress which the barge haulers cannot use. Roerich`s Foreign Guests was painted in 1901 in Paris. This picture is a part of a cycle of paintings ‘Russian Beginning. Slavs‘. The painting was bought by Nicolas II of Russia and then placed to the State Tretyakov Gallery, a bit later to The Russian Museum. The style of the Guests includes some parts of old Russian icon painters` style combined with modern trends. 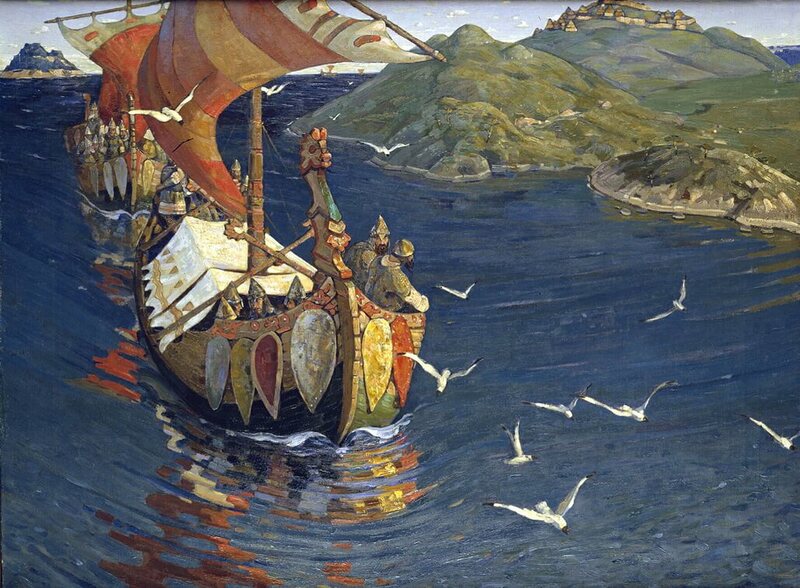 According to some art critics, the ship goes to Slavs` settlement to put an end to war and make peace. The Slavs are not scared of its appearance. The sea is calm and the weather is good – it`s a symbol of peaceful visit. 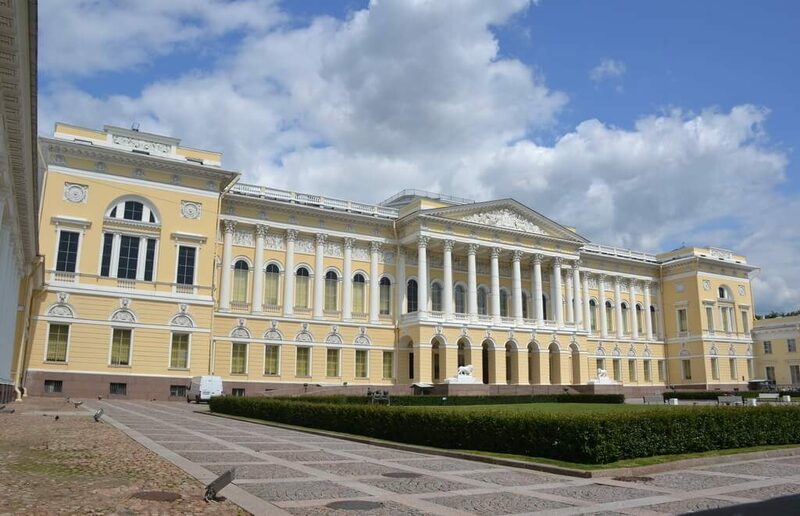 Read also our post about The Most 10 Famous Paintings At The Hermitage Museum.